Rafael Nadal hailed his 11th French Open title as "just incredible" after he demolished Austria's Dominic Thiem 6-4, 6-3, 6-2 despite a worrying injury scare in the closing stages of Sunday's final. "It's really just incredible. I played a great match against a great player," said Nadal. "I had tough moment in the third set with cramps in my hand. I was very scared but that's sport -- it was very humid. "To win 11 times here -- it's fantastic and not something I ever dreamed of. "It is always my dream to win this trophy, you all know how important the tournament is to me. "So I hope to see you all again next year." 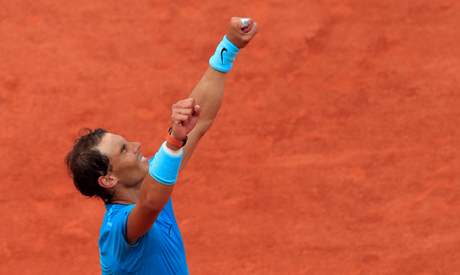 "Rafa, this is one of the most outstanding things an athlete has achieved in any sport," said the seventh seed. "I saw you win this in 2005 when I was just 11 years old. But I never dreamed of getting the chance to play the final here." With a celebrity audience -- including actors Hugh Grant and Tim Roth as well as French stars Marion Cotillard and Jean Dujardin -- watching, Nadal flew out of the blocks. Whatever the problem, his dominance remained and a love game took him to 4-2 before he eventually sealed victory on a fifth match point when the Austrian fired another backhand long.